Who is she that cometh forth as the morning rising, fair as the moon, bright as the sun? The whole universe is invited to acclaim the glories of the Ascending Christ. He is surrounded with the just of Limbo, with the souls who had finished their purgatorial expiation and probably with the saints who came out of their tombs on Easter Sunday: "Ascending on high He has led captivity captive". To celebrate Pentecost try this delicious moist cake, inexpensive and easy to make. It is served with a strawberry frosting. Construct this Pentecost wheel to remind children of the working of the Holy Spirit in their lives. After constructing the wheel, begin using it seven days before Pentecost, discussing a gift of the Holy Spirit each night. It was to St. Philip that Christ addressed his remark concerning the feeding of the multitude. The roundels represent two loaves of bread. This symbol refers to the tradition that St. James was cast down from a pinnacle of the temple in Jerusalem, stoned and sawn asunder by the Jews. Chosen, by lot, to replace Judas Iscariot, St. Matthias served as a missionary in Judaea, where he is said to have been stoned and beheaded. A battle axe with silver head and tawny handle, white open book with inscription "super Mathiam". The fleur-de-lys is a symbol for the Blessed Virgin Mary and is derived from the Madonna's lily. 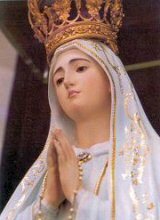 You are all-beautiful, O Mary! You are the glory, you are the joy, you are the honor of our people! 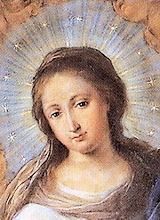 The month of May is dedicated to The Blessed Virgin Mary. The entire month falls within the liturgical season of Easter, which is represented by the liturgical color white — the color of light, a symbol of joy, purity and innocence (absolute or restored). 1.Joseph the Worker, Opt. Mem. 10.Damien de Veuster, priest; John of Avila (some places), Opt. Mem. 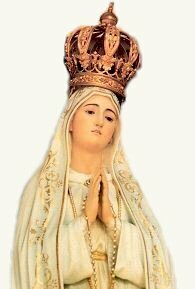 13.Our Lady of Fatima, Opt. Mem. 15.Isidore the Farmer (USA), Opt. Mem. 20.Bernardine of Siena, Opt. Mem. 21.Christopher Magallanes and companions; Eugene de Mazenod (Canada), Opt. Mem. 22.Rita of Cascia, Opt. Mem. 25.Optional Memorial of St. Bede the Venerable, priest and doctor; St. Gregory VII, pope; St. Mary Magdalene de Pazzi, virgin, Opt. Mem. 27.Augustine of Canterbury, Opt. Mem. The Gospel readings for all the Sundays in May are taken from St. John and are from Year C, Cycle 1. The Gospel is about Jesus as the Good Shepherd. Christ gives the commandment to love as He loves. In this Gospel, Jesus promises to send the Holy Spirit. 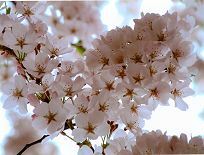 As Spring blossoms forth and we are surrounded by new life, we spend this month full of the joy of our Easter celebration and in anticipation of the coming of the Holy Spirit, our Consoler and Advocate. The saints that we will focus on this month — those who have already shared in the rewards of the Resurrection — are St. Joseph the Worker (May 1), St. Athanasius (May 2), Sts. Philip and James (May 3), St. Damian the Leper (May 10), St. Nereus & Achilleus, St. Pancras (May 12), Our Lady of Fatima (May 13), St. Matthias (May 14), St. Isidore the Farmer (May 15), St. John I (May 18), St. Bernadine of Siena (May 20), St. Christopher Magallanes (May 21), St. Rita of Cascia (May 22), St. Bede, St. Gregory VII and St. Mary Magdalene de Pazzi (May 25), St. Philip Neri (May 26), St. Augustine of Canterbury (May 27) and the Visitation (May 31). The world is resplendent with Spring's increased light and new growth. It is Mary’s month in the Easter season and all of nature rejoices with the Queen of heaven at the Resurrection of the Son she was worthy to bear. During the remainder of Easter time, let us endeavor through the prayers of the Holy Liturgy and the Holy Rosary to deepen our gratitude for the mystery of our Baptismal rebirth in Christ. "The month of May, with its profusion of blooms was adopted by the Church in the eighteenth century as a celebration of the flowering of Mary's maidenly spiritualityâ€¦With its origins in Isaiah's prophecy of the Virgin birth of the Messiah under the figure of the Blossoming Rod or Root of Jesse, the flower symbolism of Mary was extended by the Church Fathers, and in the liturgy, by applying to her the flower figures of the Sapiential Books-Canticles, Wisdom, Proverbs and Sirach. Pentecost, the birth of the Church, is also among the celebrations of May. Though sprung from the side of Christ on the Cross, the Church marks as her birthday the descent of the Holy Spirit on Mary and the Apostles. At the 'birth' of the world, the Holy Spirit  the Breath of God  was the "mighty wind [that] swept over the waters" (Gen 1:2); at the birth of the Church He is present again "like the rush of a mighty wind" to recreate the world in the image of Christ through His Church (Acts 2:2). We, the members of Christ’s Mystical Body, are the present-day disciples sent by the Holy Spirit to bring Christ to the world. May we go forth as did Mary, who set out in haste to assist St. Elizabeth (feast of the Visitation, May 31). Come upon us, O Holy Spirit, so that, with Mary, we may proclaim the greatness of the Lord who has done great things for us  for his mercy endures forever!